Be the first to share your favorite memory, photo or story of Bishop Christopher. This memorial page is dedicated for family, friends and future generations to celebrate the life of their loved one. Bishop Christopher Lee Chambers Sr was born on November 20, 1961 to Inez R. Harris and the late Samuel L. Chambers. He received the Holy Ghost at an early age. He graduated in 1978 from Lakeland Sr. High School. Chris was an encourager and enjoyed talking to people about God. He was known by his beautiful smile. Chris was preceded in death by his father, Samuel L. Chambers and cousin, Tasha Patterson. He leaves to cherish his memories, his wife, Patricia Chambers,, his first wife, Sheila Chambers; sons, Chris Jr., Joshua, and Anthony Chambers; his mother, Inez R. Harris( Elder Elijah Harris Sr.); one granddaughter, Chriszayia Chambers; sisters, Brandie Gordon, Gloria Strong, Lousha Murphy (Randy), Glovenia Harris, Collette Ellis (Thomas), Florence Davis (James) and Pat McCreary; brothers, Isaac Harris (Nadine), Elijah Jr. (Mary), and Sam Harris: mother & father-in-law, Deacon Warren and Betty Wilson; sister-in-laws, Yvette Mosley and Tangy Williams; brother-in-laws, Warren Jr., Clifford, James, and Johnny Wilson; Aunts, Loretta Sims (Earl), Lakeland, Eldora Robinson (NJ), and Arnita Robinson (NJ); Uncles, Bobby Robinson (Mary), Curtis Robinson, Timothy Robinson, Master Robinson III and Patrick Robinson; speicial friends, Flint Barnes, Ira Lightsey, and Bishop Henry Ross; a host of nieces, nephews, cousins, other relatives and friends. To send flowers or a remembrance gift to the family of Bishop Christopher Lee Chambers, please visit our Tribute Store. 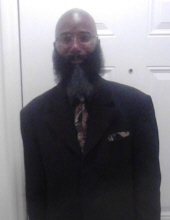 "Email Address" would like to share the life celebration of Bishop Christopher Lee Chambers. Click on the "link" to go to share a favorite memory or leave a condolence message for the family.